Britons around the country woke up to the first major snowfall of the year this morning as freezing conditions saw temperatures plunge to an eye-watering -4C. Severe warnings have been put in place (shown inset) as a blast of Arctic air sweeps across the UK (top, snowfall in Stanley, County Durham), cutting daytime highs in half from around 11C to 5C, bringing an end to the recent mild conditions and heralding a new spell of wintry weather. 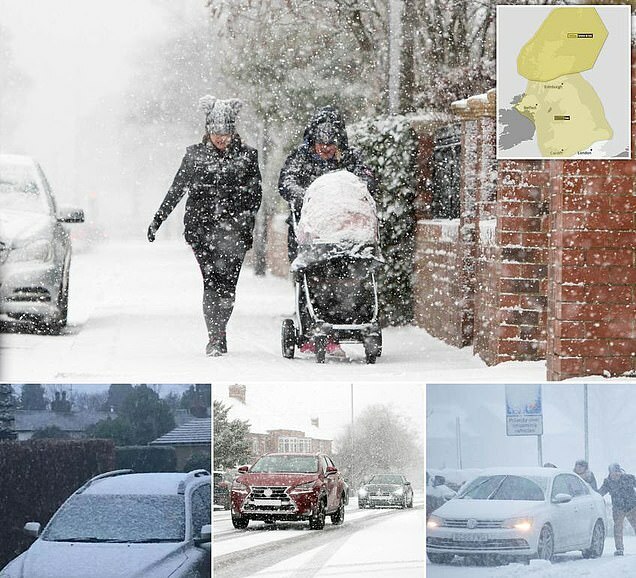 Forecasters said A-roads were likely to be affected by treacherous travel conditions (bottom right, a car stuck in fast-falling snow in Aboyne, Aberdeenshire is given a helping hand by passersby, bottom midde, traffic in Newcastle), with longer journey times expected by both bus and train, causing Britons to joke about the impending 'snowmageddon' on social media. The worst affected areas have been in northern England and Scotland, where snow has settled across the Western Isles, and forecasters expect up to 1.6in (4cm) over the Highlands and Grampians within a 24-hour period, although there were also flurries in Buckinghamshire.